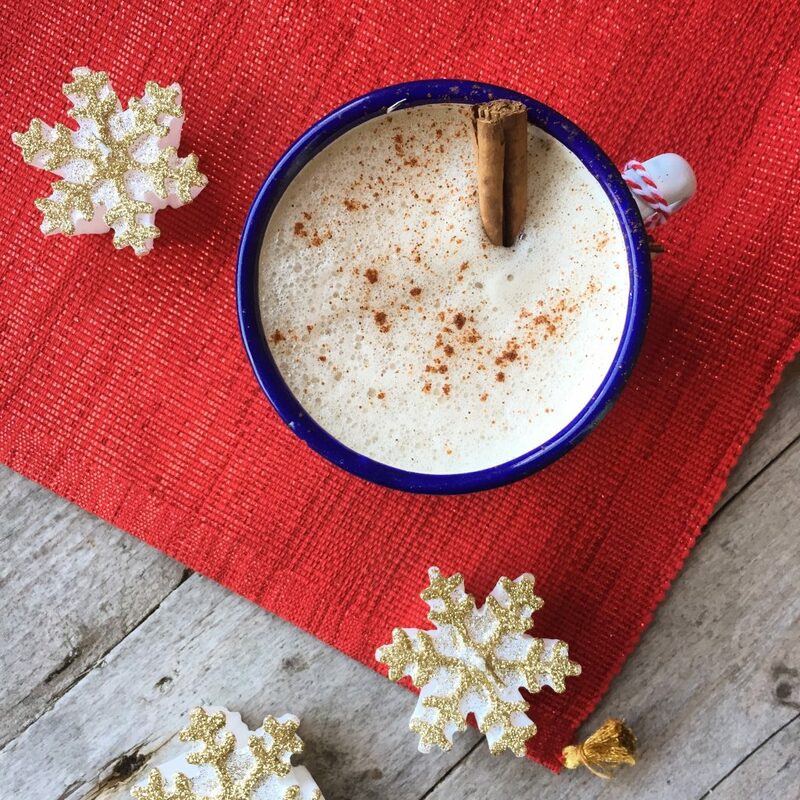 This is my take on the ultimate winter warmer…the gingerbread latte. Hot, spicy and sweet it’s the perfect thing to curl up with on a cold afternoon. My gingerbread latte recipe doesn’t include coffee, instead a beautiful combination of spices and fiery ginger provide all the flavour. It’s also vegan as I use a good quality almond milk to create the creamy flavour. You’ll start by making a gingerbread latte syrup. This is not your average ‘coffee’ syrup as it uses coconut sugar which has a much lower glycemic index than other sugars, that means it won’t cause your cause your blood sugar to spike and then drop, so no mid-afternoon slump for you! You can store the syrup for ages in the fridge, so you’ll be able to make yourself a gingerbread latte in moments whenever you need something sweet to warm you up. Plus just cooking this syrup will make your kitchen smell so good, you’ll feel like you’re living in a gingerbread house! 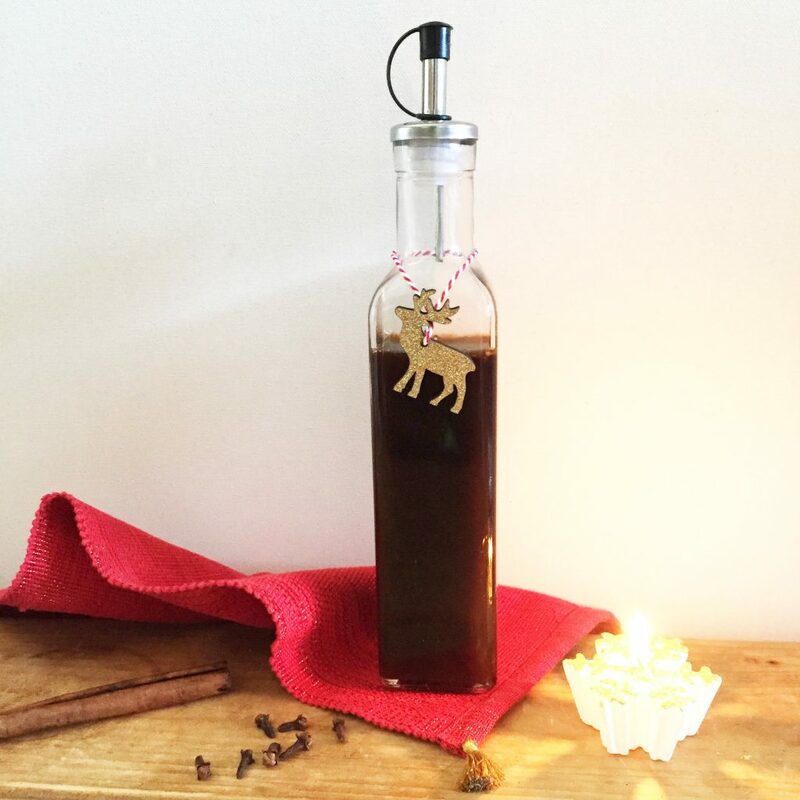 The gingerbread latte syrup also makes an amazing gift. Just pour it in to a pretty bottle, add a handwritten tag and decorate it with a pretty ribbon. Your friends and family will love it. Start by making the gingerbread latte syrup. Put all the syrup ingredients in a large saucepan on a high heat. Bring to the boil, then turn down the heat to medium and simmer for 30 minutes stirring occasionally. Remove from the heat and leave to cool. Strain the syrup through a sieve in to a sealable container (bottle, jar etc) and store in the fridge. 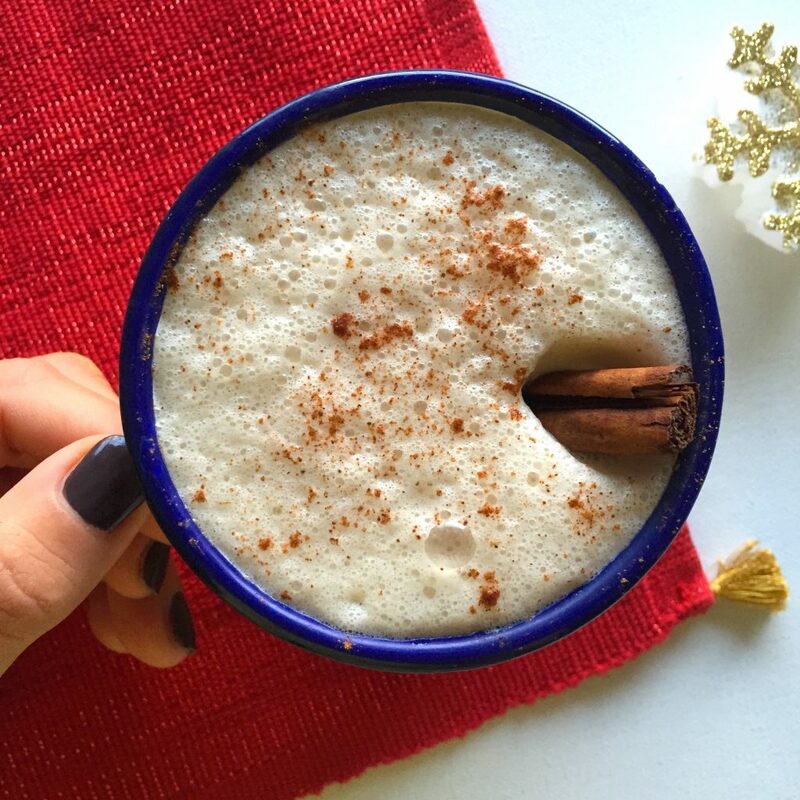 To make your mug of ginger bread latte place a small saucepan on a medium heat and warm your almond milk. When it is hot but not yet boiling whisk in the latte syrup then pour in to a mug (or see my recipe note below). Top with an extra sprinkling of cinnamon or grated nutmeg. If the syrup seems too thick and gloopy you may have just reduced it a little too much. If so just add boiling water until you have your desired syrup consistency. If you have a nutribullet or similar blender put your warm milk and syrup in it and blend it. You’ll end up with a really frothy mix when you pour it out in to a cup. Try it – it’s amazing! Picking a really good almond milk makes all the difference here! I find the Rude Health almond milk is really delicious. For an extra decadently delicious gingerbread latte add a spoonful of whipped coconut cream and an extra drizzle of syrup on top. I picked up an oil drizzle bottle for 50p from Poundland (yes 50p in Poundland ) which works perfectly for storing the syrup in, or drizzling in to your cup and over the top of your latte. If you liked this recipe make sure you sign up to the Shine newsletter here for weekly health and well being inspiration, online yoga classes, recipes and more!